Leave it to the avant-garde Aira (The Musical Brain, 2015, etc.) to combine a meditation on relevance with a full-on zombie apocalypse. 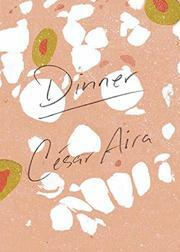 In this characteristically slim but linguistically cagey story, Argentinean novelist Aira combines a comically observant depiction of an awkward dinner with a truly bizarre account of the dead returning to life. The unnamed narrator is a 60-year-old confirmed bachelor who finds himself bankrupt, depressed, and living with his caustically judgmental mother. One night the man and his mother are invited to dinner by a friend, who regales them with stories of his travels, a tour of his fantastical trinkets, and over-the-top vignettes. “All the stories he told us could have been illustrated with story-book pictures,” says the narrator. “Even those he told in parentheses or as digressions, as when he explained why he couldn’t use the sage he grew in his own garden for the meal. It turned out that an 88-year-old dwarf had fallen on the planting bed from a great height and had crushed his delicate herbs. Was that not astonishing?” Returning home, his mother retires to bed while our narrator descends into his usual unemployed habit of surfing the television. “It didn’t even have the charm of the ridiculous,” Aira writes. He lands on a channel showing a young woman and her cameraman chasing adventure through the late night when they stumble upon reports that the dead are rising from the grave. The narrator plays out the gruesome scene, which only ends when the village’s elders start calling out the names of the dead, who return quietly to their graves. What does this mean? The author is coy on resolution but he does offer up a resounding note of hope. “You have to know how to see beyond the interests of survival and make the decision to give something to the world, because only those who give, receive,” he writes. An outlandish but absorbing meditation on being alive among the dead.